· Kurgan burials substituting flat graves. · Dead in the crouched position, substituting the previously standard supine position. · Rich grave goods revealing social stratification. · Animal husbandry including widespread horse imagery and likely horse domestication. Early Khvalynsk (ca. 5300–3900 BC) probably began from an autochthonous group of the Middle Volga region—near the site that gives the culture its name—closely related to the previous Neolithic Volga–Ural groups (Samara and Orlovka), expanding rapidly into neighbouring regions. Changes during the second stage of sites showing continuity with Samara material culture, at the beginning of the 5th millennium, are marked by strong influences from the Khvalynsk culture, with pottery showing technological changes and more variety, as well as typical Khvalynsk features, such as clays containing silt, wicker elements in ornamentation, etc. Pottery also partly continues the previous Syezzhe tradition. (Vybornov et al. 2016). The Khvalynsk culture started to settle in the south of the Volga valley, reaching about 4900 BC wormwood deserts to the north-west of the Caspian area, and the Mangyshlak Peninsula in the east of the Caspian area, witnessed by many finds of ceramics with comb decoration, where the Khvalynsk population partly assimilated the native inhabitants of the North Caspian culture. A part of the North Caspian culture probably migrated to the Saratov Trans-Volga region, where it was assimilated to the Orlovka culture (Kotova 2008). The Khvalynsk culture expanded to the south and west along the Lower Danube into the north Caucasian region from ca. 4800 BC, with the Nalchik cemetery in the northern Caucasus steppe being synchronous with this early stage (Vybornov et al. 2018). At the same time, Khvalynsk expanded to the west into the Don–Kalmius interfluve, developing a significant area in the north Pontic region with the so-called Novodanilovka group, including synchronous findings reaching the lower Danube region and beyond with the so-called Suvorovo group (Kotova 2008). The sudden expansion of Khvalynsk settlers from the Volga–Ural in all directions (Figure 10) marks the development of a Khvalynsk–Novodanilovka cultural-historical area, dominating over the steppes from the lower Danube to the Middle Volga, the Caucasus, and the Trans-Caspian area showing common funerary sacrifices of domesticated sheep, goats, and cattle, connected with an increase in the number and diversity of new types of body ornaments in graves, some made of exotic materials, including copper, and polished stone maces (Anthony 2016). Figure 10. 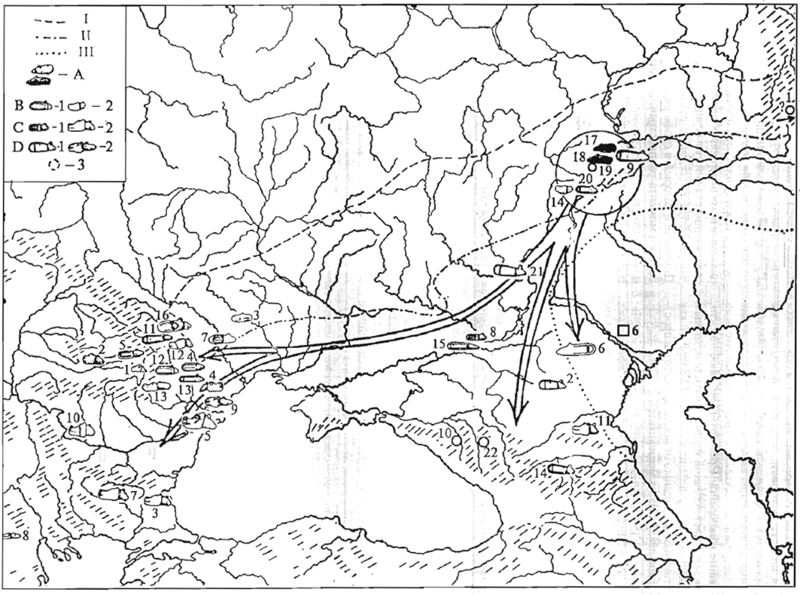 Map with likely route of migration of Khvalynsk settlers into the northern Caucasus and the Balkans. I) southern border of forest-steppe; II) southern border of steppe; III) border of semidesert. Cultures: 1) Burial complexes and settlements of Khvalynsk (1A – Middle Don; 1B – Northern Caspian; 1C – Western Caspian); 2) Burial complexes and remains of the Novodanilovka type (2A – Eastern; 2B – Western); 3) Pre-Maikop (Steppe Eneolithic); 4) Sredni Stog; 5) Cucuteni–Trypillia; 6) Bolgrad–Alden’ – Gumelniţa–Karanovo VI; 7) Krivodol–Sălcuţa. From Dergachev (2007). The Khvalynsk culture, genetically related to Samara, preserves traditions of the ritual, cultural meaning, the treatment of the horse imagery in funeral contexts, including altars, horse bones, and funerary rites. At the same time, it is in this precise culture that the image of the horse—included in the social symbolism, such as horse-head pommel-sceptres—acquires for the first time a special, maximum social significance. The appearance and subsequent widespread distribution of similar social symbols in the whole Khvalynsk–Novodanilovka cultural-historical area, through the expansion of Novodanilovka-type objects, could be considered as another qualitative leap in the social significance of the horse. Figure 11. Left: Development of sceptres after Dergachev (2007), with more abstract (left) and more realistic (right) horse-head motif. 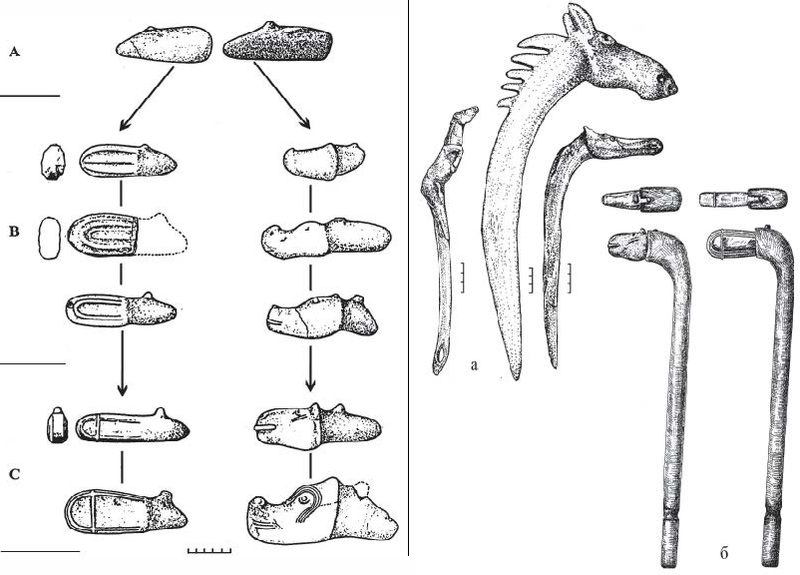 Right: Restoration of sceptres: (a) Models for restoration – Late Mesolithic and Neolithic elk-head staffs from the east European forest zone (b) supposed appearance of Eneolithic sceptres on the hundle with the clutch. From Dergachev (2007). The explosion of horse symbolism has been interpreted as a signal of the start of horse-riding technique in the eastern cultural area, with the horse becoming a necessary instrument for long-distance travel, for transport, for raids, and for war (as a means for quicker movements rather than their use for mounted war per se), facilitating thus the culture’s rapid expansion. While bone remains show a similar proportion in the contemporary early Sredni Stog groups of the north Pontic steppe and forest-steppe areas during the 5th millennium BC, supporting the relevance of the domesticated horse in their subsistence economy, horse remains are strictly limited to an economic context, without social or symbolic meaning (Dergachev 2007). Clear archaeological evidence for the development of horseback riding is found in the early–to–mid–4th millennium BC in the Botai-Tersek culture of central Asia, in the expansion of Repin herders, in Maikop and Transcaucasian cultures, and in Armenia. Archaeology points thus a likely expansion of the technique from a single source at the turn of the 5th–4th millennium BC, which is compatible with an earlier, autolimited expansion of incompletely tamed horses (not adapted for many relevant tasks seen in later cultures) with Khvalynsk chieftains in the mid–5th millennium BC (see §V.7.2. Late Repin). Horse palaeontological and archaeological data suggests that the Urals were a potential constraint for the dispersal of horses between Europe and north-central Asia, and that suitability for the species steadily improved in western and south-eastern Europe from ca. 6,000 to 3,000 years ago. The Caspian Sea was possibly the westernmost boundary of Asian horses, which probably became adapted to the new areas in the Pontic–Caspian steppes and to the west from the 5th millennium BC on (Leonardi, Boschin, et al. 2018). Figure 12. Map of regional–chronological morphological developments of horse-head sceptres. A) Original (Khvalynsk) variant. B) More complex forms including schematic Byrlelesht’ and realistic Khlopkovo-Ariushd variants. C) Transitional forms, including schematic Konstantinovka-Velen’ and realistic Drama-Fedeleshen’ variants. D) Extremely complex forms, including schematic Arkharinskiy and realistic Kasimcha-Suvorovo variants. From Dergachev (2007). The use of barrow burials or tumuli has been argued to appear as a local north Caucasian feature, with origin in the 5th millennium BC, and also in the southern Caucasus, with the Leilatepe culture, from where it spread north. Other barrows are later found up to north-west Iran. Although evidence is too scarce to select a precise origin, the early Khvalynsk–Novodanilovka burials, on the Pontic–Caspian steppes, are the first to feature rich, ochre-sprinkled graves under kurgan-like structures (Korenevskiy 2012). The addition of the tradition of ochre staining (originally from the steppes) to the emerging proto-kurgans supports that these structures emerged with the contacts of steppe cultures with the Caucasus. The standard posture on the back with knees raised, with their heads to the north and east (Anthony 2007), characteristic of Khvalynsk-type burials, point to the expansion of the Khvalynsk–Novodanilovka cultural-historical area as the starting point of this tradition in the steppes. All members of society are considered represented in the earliest Khvalynsk cemeteries, although there is a clear emerging trend during their expansion for elite male burials to predominate. Rich grave assemblages include stone clubs and axes, animal-head sceptres, long flint blades, and ornaments for clothing, many made of copper. These rare copper objects like rings and beads, most likely from western industries, are more common in elite male graves, as are animal sacrifices and red ochre (Murphy and Khokhlov 2016). The emerging kurgan structures were probably not simple pits filled with earth. There was a belief that the funerary structure was the place where the buried moved to another world, and in that sense similar funerary structures reflect certain egalitarian ideas, so the evolution from collective necropolis to the rich grave assemblages reflect the meaning of prestige objects as symbols that emphasise social status, and thus an evolution to a kinship-based, elite-dominated organisation into small families, as well as a potential function in the transition to the afterlife (Korenevskiy 2012). The new social elites identified themselves through grave goods and grave construction, marked the status with clothing (copper jewellery) and symbols of power (mace and sceptre). The existence of similar children’s graves supports the membership to social groups being acquired by birth. This common evolution in the whole Khvalynsk–Novodanilovka cultural-historical area supports the emergence of tightly structured elite social groups expanding from the east (Parzinger 2013). Ceremonial skull-scraping of the parietal bone, consisting of one to seven gouges about 2–3 cm in length in the parietal bone surface, may appear mainly in mature adults (Khokhlov 2016), with some cases clearly associated with elite burials. Zoomorphic sceptres represented probably a ritual source of power for Khvalynsk chieftains, political and/or religious leaders, as evidenced by the unique zoomorphic carving found in Ekaterinovka (a riverine settlement) in the second half of the 5th millennium, resembling a toothed fish or reptile, rather than the most common horse-related motifs expanding with Novodanilovka–Suvorovo settlers. The finding of similar elk-head staffs in Mesolithic–Neolithic cultures of northern and eastern Europe and the Trans-Urals region may suggest an ancient cultural connection of this tradition through northern Eurasia. Early kurgan-like or proto-kurgan constructions in the Pontic–Caspian steppes are found thus associated with the expansion of Khvalynsk–Novodanilovka chiefs, featuring similar constructions to mark elite graves: rooves made from separate slabs with cairns are known in the Dnieper and Volga regions (17% of burials in early Khvalynsk were superimposed with stone cairns or had a single stone marker); cists with cairns are known from the northern Donets and Azov areas; and a unique cromlech is found in the Dniester–Danube area, among Suvorovo graves. Apart from these stone constructions, in the Volga and northern Caucasus region sometimes natural hills or small earthen or wooden constructions are used as burial markers (Rassamakin 1999). Stable isotopes in the bones of Khvalynsk individuals show that their diet depended to a large extent on fish (Schulting and Richards 2016), although domesticated animals also feature prominently in the Khvalynsk culture, accompanying thus a food-producing economy (Vybornov, Kosintsev, and Kulkova 2015). Sheep and goats were sacrificed more than any other species in ochre-stained ritual deposits in Khvalynsk; cattle predominated on the lower Dnieper; and horse bones dominated in between. Given the data from the predominant diet, domesticated animals may have been reserved for their use as a ritual and feasting currency associated with the political competition between a new social rank of elites (Anthony 2016; Anthony and Brown 2011). There is an evident causal relationship between the emergence of a warrior class of social leaders and the spread of cattle herds through widening grazing lands, and between their rapid westward spread and imagery evidencing the domestication of the horse (and its use as a riding mount). Deposits from Ukraine, the Caucasus or the Urals were not used at this moment, so metal imports came probably from Balkan and Carpathian mines, which supports a dense network of extensive trading links through the north Pontic steppes up to the Volga (Parzinger 2013). The Khvalynsk expansion represents thus the start of the Eneolithic era, as the time of development of a prestigious economy that marked social elites ​​through different valuable objects, many of them obtained through exchange networks, reflecting the direct or indirect involvement of the owners. Among them were items requiring high skills or complex manufacturing techniques (different woollen tools, sceptres, stone bracelets); tools that occupy an important role in labour, war and industry (stone flat axes, arrowheads, knife-like plates, and chips of flint); iconic objects (bone plates from canine fang, pins, bone sticks with a hole); beads (from bone, stone, shell, and bead washers that could be collected in whole garlands, acquiring a special value); copper jewellery (beads, rings, bracelets) (Korenevskiy 2012). Since the early 6th millennium BC objects and ideas flew in a single direction, from central (Linearbandkeramik) and south-eastern (Old European) cultures to the Pontic–Caspian steppe. This changed from the mid–5th millennium on, when movement is seen also from the steppe to the west, driven by the newly found human mobility (Heyd 2016). The Suvorovo–Novodanilovka group appear in the north-west Pontic area, the Lower Danube, and Dobruja, reaching to the south the Upper Thracian Plain and northern Greece, and to the east the east and central Carpathian Basin, up to central Europe. They are recognised by their rich individual primary graves displaying ostentatious prestige goods, whose inventory included jewellery (shell necklace, copper goods, rarely gold), tools (flint and copper) and weaponry. The most conspicuous objects are the high technology flint inventory, with axes, long blades, and triangular silex spearheads sticking out (Heyd 2016). Individuals were laid on their back, extended or crouched, with slightly bent knees on the side, and oval to square graves (Figure 13). Ochre staining of the entire grave is the norm, including whole ochre pieces. A short, still quite shallow mound can be seen over the grave, sometimes with circular stone structures either around the grave (as in Suvorovo) or around the mound. Zoomorphic (usually horse-head) sceptres were particularly common in the south, while in the north-west and west Pontic areas (and in the east Carpathian Basin) they represent mostly isolated finds, and comparable pieces are abstract stone sceptres and stone mace heads with knob decoration. The farthest south that these materials are found is Suvodol–Šuplevec, northern Macedonia, in the south-east Balkans (Heyd 2016). To the west, the farthest finds are in the Csongrád–Kettőshalom site, dated ca. 4370–4240 BC (Horváth et al. 2013). The most recent radiocarbon dates show that these findings appear in south-east Europe from about 4600 BC—contemporaneous with the rich graves of the Necropolis from Varna I—to ca. 4000 BC. Steppe imports are found in Gumelnița, in the Lower Danube region, from about 4400 BC, pointing to an established trade network (Reingruber and Rassamakin 2016). 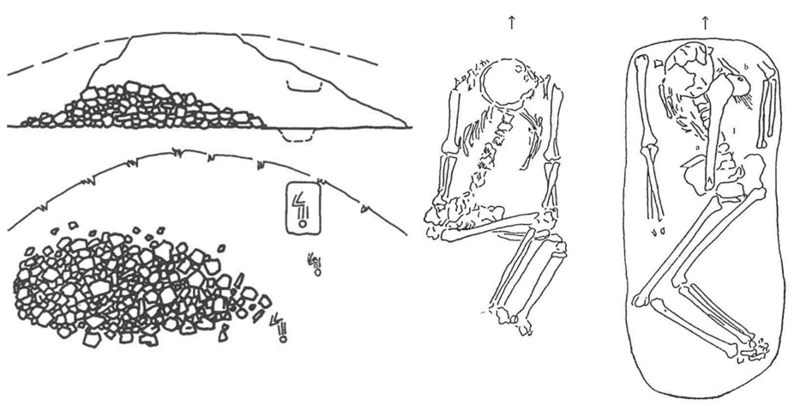 A the end of the Early Eneolithic, the Varna necropolis ceases to function, and the Suvorovo elites disappear, although Cernavodă I, continues to show burials similar to north Pontic findings ca. 4000–3750 BC (Heyd 2016). While the Suvorovo expansion marked the beginning of long-distance exchange of prestige goods with the steppe, and they did not represent a massive migration, the “infiltration” of settlers was enough to cause the abandonment of settlements by the Gumelniţa population of the left bank of the Danube when the steppe tribes appeared. There is little evidence of armed conflict, so it is possible that the crisis of local agricultural economy may have caused this abandonment. There may have been a gradual, peaceful process of assimilation of the Suvorovo settlers by the local Gumelniţa population, favoured by the crisis of the local agricultural economy, which is seen by many scholars as the process by which the Cernavodă I culture came into existence (Heyd 2016). Figure 13. Suvorovo/Novodanilovka graves Kjulevca, and Targovište-Gonova Mogila, grave 1 (Bulgaria) after Govedarica (2004) and Heyd (2016). These kurgan findings show funerary rites and technology, but there are no associated settlements. They appear in parallel to complex organised settlements like those of Cucuteni–Trypillia, Bolgrad–Aldeni, Varna, Kodžadermen–Gumelniţa–Karanovo VI and related cultures, with which they participate in economic exchange (Suppl. Fig. 7). Based on the number of graves among these groups, we can say that the size of the infiltration must have been rather small (Heyd 2016). It was probably the arrival of Suvorovo migrants what triggered the idea of lavish grave furniture and the display of wealth, prestige, power, and social position in the graves of Copper Age sedentary farming communities of south-eastern Europe. The Varna I cemetery is the clearest representative of the expansion of the new mentality to the Balkans, and has been recently dated more exactly to ca. 4590–4340 BC (Krauß et al. 2017). Characteristic ceramics are based on features known from the late Chalcolithic ceramic complexes in Durankulak (tell and necropolis), Devnia, the Varna lake settlements and necropolis. Fine ceramic is thin-walled, with a light grey turning into black, burnished, smoothed surface, with pots having upper cylindrical and rounded parts or being bi-conical forms with vertical handles. The composite S-profile and strongly outward curved mouth rim were one of the most typical elements of the complex, together with ring-like bottoms, and the most emblematic ornamentation was the “Ezerovo” type, in which the motif’s background was engraved and encrusted, with the ornament itself remaining embossed, as well as the flutted decoration (Petrova 2016). While the richness displayed by the Varna cemetery and its accumulation of wealth are unique in south-eastern Europe, similar accumulations of material wealth are encountered in isolated finds all over the Balkans and the Carpathian Basin, reaching Greece and Anatolia. Metallurgy requires material and skills which are not readily available, which means that elites kept control of them by limiting people’s ability to access and produce metals themselves. In fact, except for the distinct material culture, the rich Varna burials and the Novodanilovka burials are essentially equivalent (Heyd and Walker 2004). 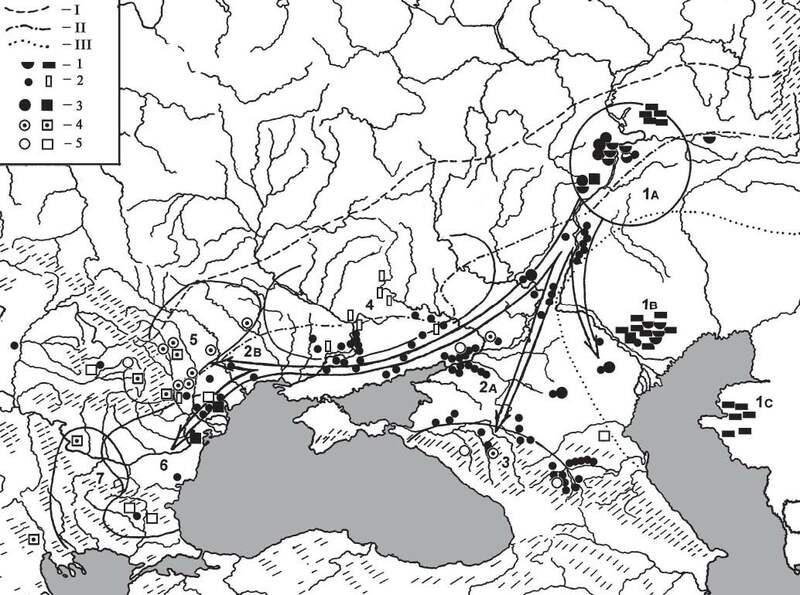 Graves and hoards demonstrate thus sharp inequality over wide parts of south-east Europe in the 5th and 4th millennium BC, showing thus social stratification, also displayed in the form of house sizes and pottery inventories (in quantity and quality) within settlements. There is thus a pattern of robust social institutions and enhanced complexity, of lineages and powerful chieftains, of networks and bonds persistent in time and space, reflected in Varna, in mega-villages of middle and late Trypillia, and in many other sites in south-eastern Europe (Heyd and Walker 2004). Three samples dated after ca. 4700 BC have been analysed from the Khvalynsk cemetery, described as hosting typically southern and northern individuals. One high-status burial, buried supine with raised knees and an assemblage of 293 copper artefacts (this grave alone accounting for ca. 80% of copper objects in the Khvalynsk cemetery) represents thus a high-status individual, member of an elite group of patrilineally-related families that was probably successful during the Indo-Anatolian expansion, reported as of haplogroup R1b1-L754 and mtDNA H2a1, unique in the region (Mathieson et al. 2015). The individual of haplogroup R1a1-M459 (xR1a1a-M198), mtDNA U5a1i, also buried on his back with raised knees, probably represents a commoner, remnant of a local population, showing more EHG-like ancestry. An old male of Q1a-F903 lineage (probably Q1a2-M25, see above §ii.5. Caucasus hunter-gatherers), mtDNA U4, and higher CHG/ANE component related to steppe eneolithic samples, who died from blows to his skull, suggests that the origin of this extra ancestral component found in Khvalynsk (and much elevated later in sampled Yamna) individuals comes from the admixture of Samara hunter-gatherer-like elites from the Don–Volga–Ural region with northern Caucasian or northern Caspian steppe populations, or both, during their expansion. Two individuals from Progress in the Northern Caucasus Piedmont (dated ca. 4600 BC and 4150 BC), of haplogroup R1b1a2-V1636, and one from Vonyuchka (ca. 4300 BC) show elevated ANE ancestry, which confirms the presence of this component in regions of the northern Caucasus with early pit grave burials—related to the Don–Caspian steppes—and support its expansion in the Don–Volga–Ural region linked to steppe elites, likely through exogamy of expanding Khvalynsk settlers (Suppl. Graph. 4). Both Eneolithic Samara and north Caucasus steppe populations analysed to date show no gene flow from Anatolian farmers, unlike contemporary samples from the north Pontic region and later samples from the Yamna culture (Wang et al. 2019). The finding of R1a1b-YP1272 as a Maikop outlier in the same kurgan in the late 4th millennium (see below §v.2. Early Caucasians), and of R1b1a2-V1636 among Yamna individuals of the Caucasus in the early 3rd millennium BC (see below vi.1. Disintegrating Indo-Europeans) further supports the possible relevance of these lineages in the Indo-Anatolian expansions associated with Khvalynsk, or else their widespread presence among Pontic–Caspian steppe populations before the Khvalynsk expansion. Based on continuity of ancestral components in later samples from Afanasevo, the early Khvalynsk community eventually stabilised (probably after ca. 4500 BC) in its admixture, remaining close to the analysed samples from the north Caucasian steppes, deriving more than 60% of ancestry from EHG, and the remainder from a CHG-related basal ancestry (Wang et al. 2019), in what can be taken a model of the so-called “Steppe ancestry” in later samples. This homogenisation of the Don–Volga–Ural, Kuban, and north Pontic areas suggests continued exogamy of Khvalynsk clans dominated by elite males with other related groups from the steppe. Other analysed elite Khvalynsk individuals (ca. 4250–4000 BC), from the riverine Ekaterinovka settlement, have been reported by Khokhlov (2018) as within the R1b1a1b-M269 tree (formed ca. 11300 BC, TMRCA ca. 4400 BC), which confirms the continuous presence of R1b1a1-P297 subclades in the region. The estimated split and successful spread of R1b1a1b1-L23 (formed ca. 4300 BC, TMRCA ca. 4200 BC), subclade of R1b1a1b-M269, further supports its association with patrilineally-related clans that expanded with early Khvalynsk around the mid–5th millennium BC. The finding of a rare R1b1a1b-M269 subclade R1b1a1b2-PF7562 (formed ca. 4400 BC, TMRCA ca. 3400 BC) in the Balkans, Central Europe, Anatolia, and the Caucasus (Myres et al. 2011; Herrera et al. 2012) may support their association with the early spread of Indo-Anatolian speakers, although their late TMRCA points to a recent expansion linked to the spread of Yamna migrants (see below §vi.1. Disintegrating Indo-Europeans). The earlier, Epipalaeolithic–Early Mesolithic origin of haplogroups R1b1a2-V1636, R1a1b-YP1272, and R1b1a1b-M269 compared to their late estimated successful expansion around the mid–5th millennium BC supports their emergence among local populations of diverse haplogroups around this time of population movements in the region. Since R1b1a1-P297 lineages were probably the latest to successfully spread into the Volga–Ural area, the presence of other lineages among Khvalynsk males suggests the resurgence of indigenous haplogroups, probably prevalent among certain local Pontic–Caspian groups before the expansion of the North-Eastern Technocomplex and hunter-gatherer pottery. Steppe ancestry has been found in one female child from the Varna I cemetery (ca. 4711–4450 BC), from the earliest burials of the first phase, richly furnished; in a young male from Smyadovo (ca. 4550–4450 BC), of a Balkan Copper Age culture (Mathieson et al. 2018); and in a Greece Neolithic sample, probably also from the middle to late 5th millennium BC (Wang et al. 2018). All these samples prove the expansion of Suvorovo settlers to the south into the southern Danube regions and beyond, up to northern Greece (Suppl. Graph. 5). However, the presence of few individuals with Steppe ancestry among two dozen Copper Age Balkan samples from the region (ca. 5000–4000 BC) further supports the nature of the Suvorovo expansion as a rapid infiltration of few steppe chieftains among local east Balkan populations. The presence of R1b1-L754 samples in the north Pontic region and in the Balkans during the 5th millennium does not prove they belong to the known lineages associated with Khvalynsk, and the presence of confirmed R1b1b-V88 subclades in both regions (Mathieson et al. 2018) frustrates their interpretation as belonging to any specific subclade. On the other hand, the presence of I2a1b1a2a2-Y5606 in Neolithic samples from the north Pontic area, and of I2a1b1a2a2a-L699 lineages expanding with Yamna (see §vii.5. Palaeo-Balkan peoples), suggests that some of these lineages were also integrated in the Khvalynsk society, and may appear associated with Suvorovo–Novodanilovka settlers. Other Pontic–Caspian steppe lineages, like R1a1-M459 or Q1a-F903, could have also accompanied these early Indo-European elites, before the further Y-chromosome bottlenecks seen in Repin and early Yamna.